This Marc Lynch post on America’s Saudi problem is worth reading for its discussion of how our uncritical support for Saudi Arabia undermines our efforts in the Middle East. America’s alliance with Saudi Arabia remains the greatest contradiction inherent in its attempt to align itself with popular aspirations for change in the region. A Saudi exception certainly makes things such as coordinating the containment of Iran easier for diplomats on a daily basis. But it sustains and perpetuates a regional order which over the long term is costly to sustain and clearly at odds with American normative preferences. It’s also notable because it remains one of the few commentaries I’ve seen to mention Mohammed bin Nayef’s trip to DC from 10 days ago. For instance, the symbolism of President Obama’s unusual meeting with new Saudi Interior Minister Mohammed bin Nayef, which looked to many Saudis like an endorsement of someone they identify with the most repressive and anti-democratic trends in the kingdom, was unfortunate. As this release from the Saudi embassy lays out in detail, MbN was in DC from January 14 through 16. There were a few explicit orders of business. 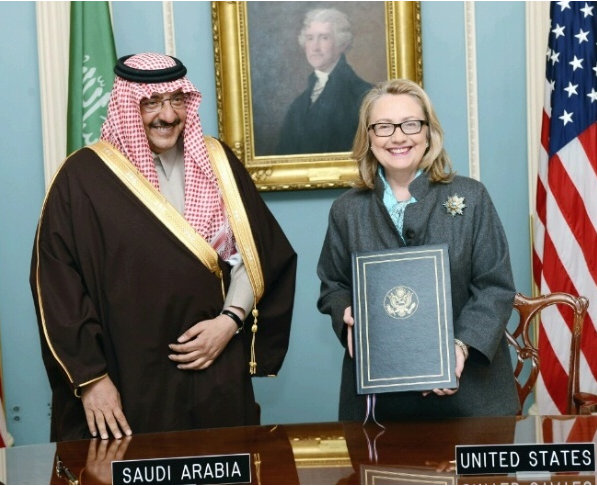 Hillary Clinton and MbN renewed the Technical Cooperation Agreement (which would have expired in May) providing US support to protect Saudi critical infrastructure, especially its oil facilities. MbN signed Memoranda of Understanding with Janet Napolitano on cybersecurity and a trusted traveler program. As Lynch noted, he was granted a private meeting with President Obama, which resulted in the following readout. Today, President Obama met with Saudi Arabia’s Minister of Interior, Prince Mohammed bin Nayef bin Abdulaziz Al-Saud, in the Oval Office. They affirmed the strong partnership between the United States and Saudi Arabia, and discussed security and regional issues of mutual interest. The President congratulated Prince Mohammed bin Nayef on his appointment to Minister of Interior and asked him to convey his best wishes to King Abdullah bin Abd Al-Aziz Al Saud. But in addition to that, MbN had a series of meetings with almost every major major player in our security establishment. Prince Mohammad also met with a number of senior U.S. officials throughout his visit, including Secretary of State Hillary Clinton, Attorney General Eric Holder, Secretary of Homeland Security Janet Napolitano, Director of National Intelligence James Robert Clapper, Deputy Secretary of State Bill Burns, Treasury Deputy Secretary Neal Wolin, National Security Advisor Tom Donilon, John Brennan, assistant to the president for homeland security and counterterrorism, Director of the Federal Bureau of Investigation (FBI) Robert Mueller, and Director of the National Security Agency General Keith B. Alexander. This leaves out only DOD and CIA (though even before he was nominated to be CIA Director, we could assume former Riyadh station chief John Brennan heavily influenced Saudi ties to CIA). Given such a high profile visit, I have been expecting someone to discuss what merited the full coming out party (aside from MbN’s November appointment to be Minister of Interior, but MbN has been serving as our counterterrorism liaison for years). But I’ve seen little reporting to explain the trip. And there are a few more reasons why I would really like to know what MbN discussed with almost the entire national security establishment. There’s Turki al-Faisal’s call for “sophisticated, high-level weapons” to be sent to Syria (not to mention the recent release of a purported April 2012 Saudi directive releasing Saudi death row prisoners to fight jihad against Bashar al-Assad). Then there’s the escalation of drone strikes in Yemen since MbN’s visit, attacking targets that have no apparent tie to America’s stated targeting criteria there–a threat to American interests. Yemen-based journalist Adam Baron has observed that the drone strikes–as opposed to overflights–have been unusually concentrated in northern provinces. interestingly, drone uptick has been concentrated in northern provinces: 2013 has yet to see one reported in shabwa/abyan/hadramawt. Add in a bit of confusion over the reported scope of the new drone rulebook. The WaPo’s report describes that only Pakistan is exempted from the rulebook, yet some have suggested that the CIA’s drone program in Yemen, too will be exempted. Then there’s the role that MbN has played in the past. In addition to being the key player on the roll-out of the TCA (more on that below), he created Saudi Arabia’s deradicalization program, which this March 2009 WikiLeaks cable ties closely to the TCA renewed on the trip. At least two former Gitmo detainees who went through the program ended up serving as infiltrators into AQAP. This Saudi-US Relations Information Service release actually points to the toner cartridge plot revealed by deradicalization graduate Jabir al-Fayfi along with the recent UndieBomb 2.0 plot–which was created by a third infiltrator directed by the Saudis–in its coverage of MbN’s visit, suggesting he may have had a role there, too. Should we expect similar operations in the near future? Note, while he is understood to have been a genuine recidivist, another graduate of Gitmo and then MbN’s deradicalization program, AQAP’s number 2, Said al-Shirhi, was reported on Thursday to have died from wounds suffered in a November counterterrorism strike. All this takes place against the background of unrest in Saudi Arabia (which Lynch describes at length). While Lynch disagrees, Bruce Reidel has been warning–and hawking a book–about a possible revolution in Saudi Arabia. To the extent the unrest represents a serious threat, it would put MbN, as Minister of the Interior, at the forefront. Interestingly, as part of the TCA renewed on this trip and led by MbN, the US helped Saudi Arabia develop a 35,000 person strong Facilities Security Force, which includes a paramilitary function, which would be crucial in the Eastern Provinces experiencing the most real unrest (the same day MbN came to the US, King Abdullah put MbN’s older brother in charge of the Eastern Province). When you couple that with the cybersecurity cooperation MbN discussed with Janet Napolitano–remember the fear-mongering around the technically simple but executed by insiders ARAMCO hack–and it suggests the US may be more worried about the Eastern Province than Lynch. So maybe MbN’s visit represents real concerns about unrest in the Kingdom (which would play into our pressure on Iran), not least because the Saudis blame Iran for the unrest among its Shia population. Or maybe MbN’s visit represents a further expansion of our already significant counterterrorism and other covert operations. I sure would like to know, though.